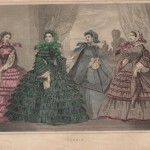 A growing collection of public domain images that showcase articles of clothing, apparel and a variety of accessories. From boots to umbrellas and everything in between, there’s bound to be something that could add a bit of vintage whimsy to your next creative project. Check back periodically as we will be adding even more vintage clothing images as we find them. If you can’t find the right clothing style or just the right image for your project, please be sure to check out our sister site which also shares free vintage images based on the less-restrictive American copyright standards. Don’t miss the wonderful Fashion Plate Images on Free Vintage Art which feature many of the latest fashions from Europe and Paris in the early 1900s. 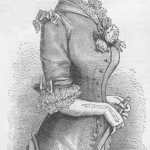 Vintage fashion images primarily from magazines published in the 1860s. They include full garments, outerwear and headwear popular at the time. Vintage clothing images for the entire family. From nightwear to formal wear there is plenty to pick from. All are in the public domain.